Value & RankThe Electricity production of Kyrgyz Republic is 14.9 ( billions of kWh) with a global rank of 80. 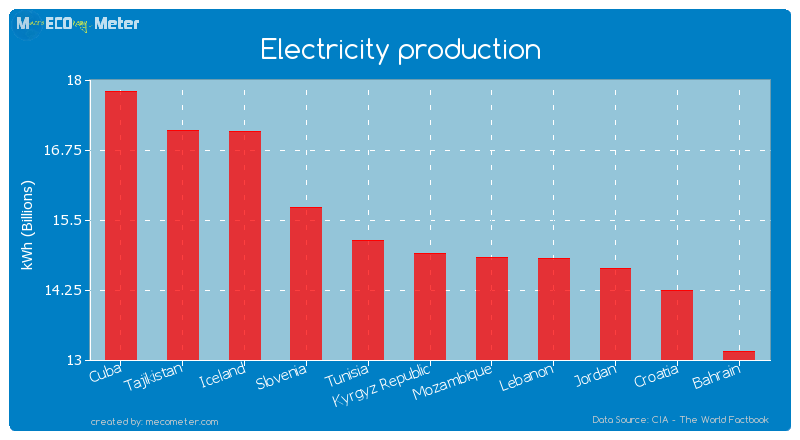 Kyrgyz Republic compared to other CountriesThe Electricity production of Kyrgyz Republic is similar to that of Cuba, Tajikistan, Iceland, Slovenia, Tunisia, Mozambique, Lebanon, Jordan, Croatia, Bahrain with a respective Electricity production of 17.8, 17.1, 17.1, 15.7, 15.1, 14.8, 14.8, 14.6, 14.2, 13.2 ( billions of kWh) and a global rank of 75, 76, 77, 78, 79, 81, 82, 83, 84, 85. Value & RankThe Electricity imports of Kyrgyz Republic is 535 ( millions of kWh) with a global rank of 76. 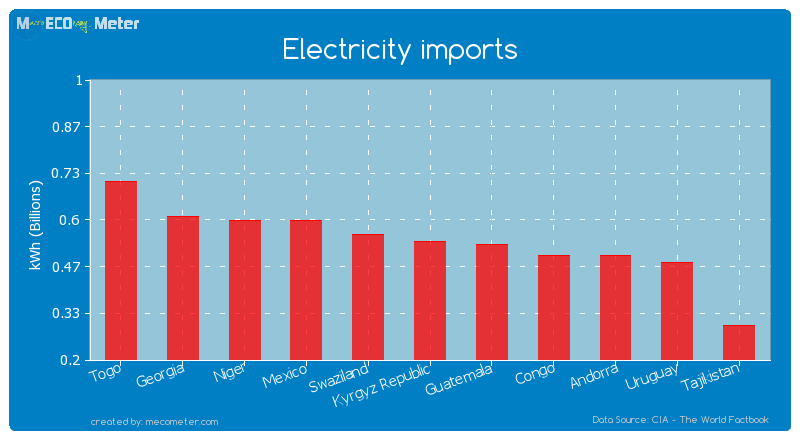 Kyrgyz Republic compared to other CountriesThe Electricity imports of Kyrgyz Republic is similar to that of Togo, Georgia, Mexico, Niger, Swaziland, Guatemala, Andorra, Congo, Uruguay, Tajikistan with a respective Electricity imports of 710, 614, 603, 600, 564, 526, 498, 495, 477, 301 ( millions of kWh) and a global rank of 71, 72, 73, 74, 75, 77, 78, 79, 80, 81. Value & RankThe Electricity exports of Kyrgyz Republic is 2.62 ( billions of kWh) with a global rank of 39. 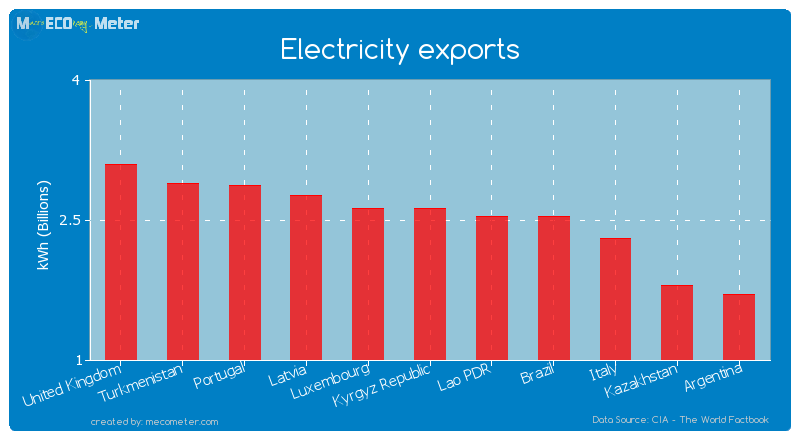 Kyrgyz Republic compared to other CountriesThe Electricity exports of Kyrgyz Republic is similar to that of United Kingdom, Turkmenistan, Portugal, Latvia, Luxembourg, Brazil, Lao PDR, Italy, Kazakhstan, Argentina with a respective Electricity exports of 3.10, 2.89, 2.87, 2.76, 2.62, 2.54, 2.54, 2.30, 1.80, 1.70 ( billions of kWh) and a global rank of 34, 35, 36, 37, 38, 40, 41, 42, 43, 44. 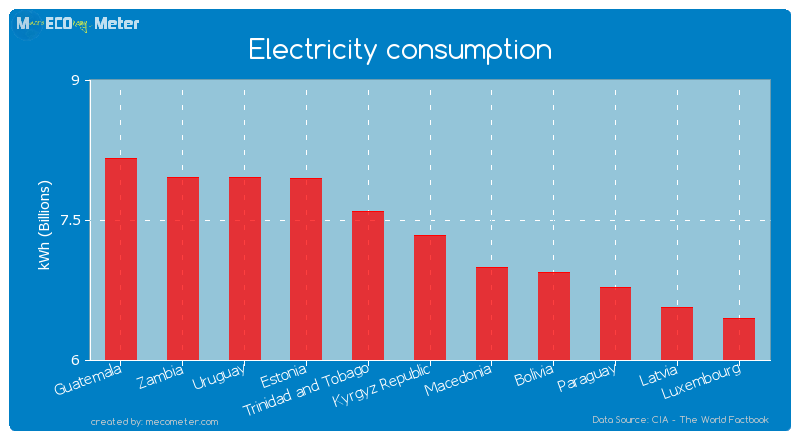 Value & RankThe Electricity consumption of Kyrgyz Republic is 7.33 ( billions of kWh) with a global rank of 96.